Mohamed Salah scored FOUR goals as Liverpool turned on the style to thrash Watford 5-0 at Anfield this evening. The Reds came flying out the blocks as Salah opened the scoring with a superb effort in the 4th minute before making it 2-0 shortly before half time with a close range strike following a superb cross from Andrew Robertson. Salah then turned provider as he teed-up Roberto Firmino to make it 3-0 just minutes after the restart with the Brazilian international flicking home a wonderful back-heel effort. Liverpool continued to dominate and Salah completed his hat-trick with another superb piece of skill as he bamboozled three Watford defenders before poking home for 4-0 in the 77th minute. 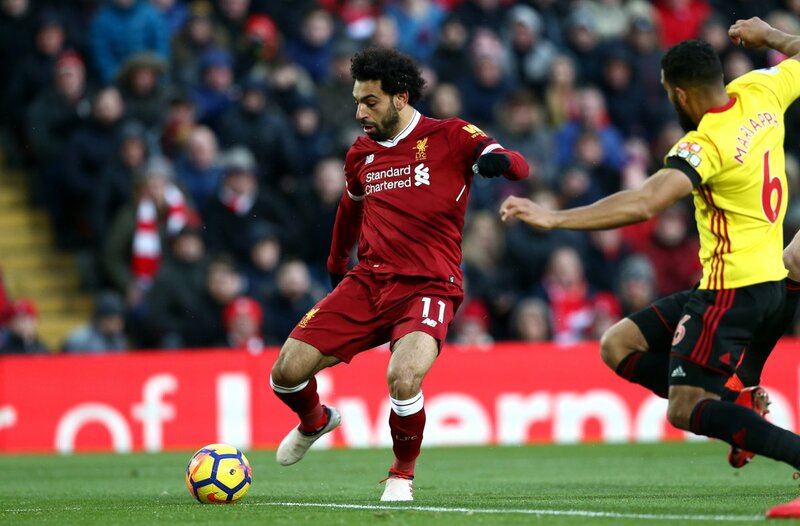 There was still time for the Egyptian super star to grab his fourth of the game as Salah was on hand to slam home the rebound after Danny Ings saw his effort saved by Karnezis. The comprehensive victory sees Liverpool climb up to third in the Premier League table and two within just two points of second placed Manchester United.